Code: Realize - Guardian of Rebirth (コードリアライズ - 創世の姫君, Code: Realize - Sousei no Himegimi? 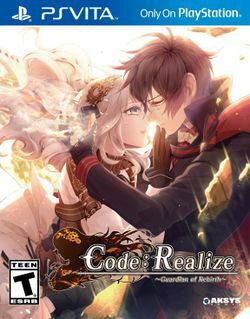 ), stylized as Code:Realize ~Guardian of Rebirth~, is an otome visual novel developed by Otomate, a subsidiary of Idea Factory that produces otome games targeted toward girls. Like most otome games, players take the role of a female protagonist and make choices that lead toward branching paths, each focused on building a romantic relationship with a male character. Code: Realize is unique in that its Victorian steampunk setting and characters are influenced by Western literature. The main male character, Arsène Lupin, is based off of a gentleman thief created by French writer Maurice Leblanc in 1905. His adversary, Herlock Sholmes, is based off of the famous private detective of the Victorian era created by British writer Sir Arthur Conan Doyle, Sherlock Holmes; the spelling of his name is a nod to the character's first encounter with Lupin, in which his name had to be rearranged due to legal issues. Characters with dedicated routes include the aforementioned chivalrous thief Lupin, vampire hunter Abraham Van Helsing (based off of the character from Bram Stoker's 1897 Gothic horror novel Dracula), Victor Frankenstein (based off of the title character of Mary Shelley's 1818 Gothic horror novel Frankenstein), Impey Barbicane (based off of the main character of Jules Verne's 1865 science fiction novel From the Earth to the Moon), and Count Saint-Germain, who is the only one of the main characters to be based off of a real-life historical figure, European adventurer and philosopher Comte de Saint Germain (1691-1784). Idea Factory published Guardian of Rebirth in Japan on November 27, 2014, and its success would lead to the release of a sequel and an anime, launching the Code: Realize series. It was localized by Aksys Games a year later, released in North America on October 20, 2015 and in Europe on October 21. On the outskirts of London, England, a young girl named Cardia lives an isolated life in an otherwise abandoned mansion. Despite her ordinary appearance, Cardia has been branded a monster due to a poison in her body that causes anything she touches to melt or rot, and so her father made her promise not to ever leave the mansion. As he is the one person she can rely on, she intends to keep that promise, even after he mysteriously disappears. However, her monotonous life suddenly changes with the arrival of Arsène Lupin, a self-proclaimed "thief with a heart of justice", who rescues her from Royal Guards that seek to capture her. With the aid of Lupin, Cardia resolves to solve the mystery of her father's disappearance, though her search may not lead to the result that she expects. This page was last edited on 25 March 2018, at 07:49.